Hey!!! If you found your way here, I'm betting you know me or someone who knows me! This isn't my first website. I have MANY more. If you would like to check them out by visiting the table of links below! If I were asked to describe myself how would I describe myself? Would I describe myself with the generic answer as being "in eleventh grade, living in New York at home with my family and pet dog" or would I describe myself differently than most? Am I really just an eleventh-grader or is there more to me than that? I am more than that and I have accomplished more than your average teenager. So, who am I? I am known in most circles as MJ, or MJ, the SMA Queen. Why am I the SMA Queen? When I was born, my parents knew I would not be like every other child. Actually, they didn't even know if I would grow up to be a child at all. 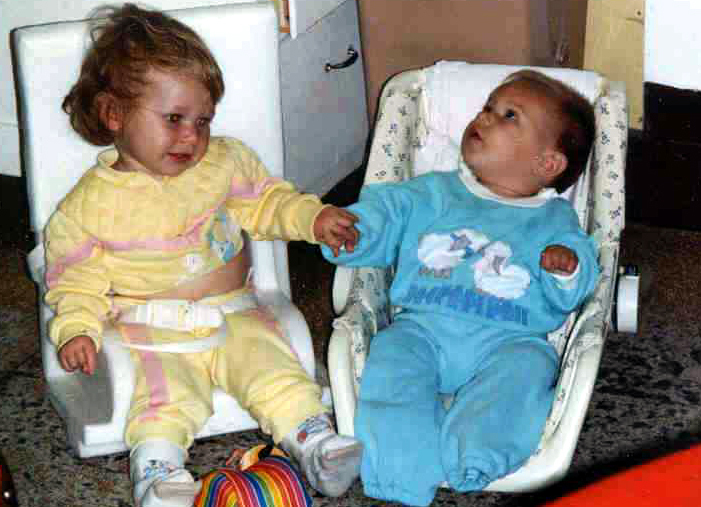 When I was six months old, I was diagnosed with Spinal Muscular Atrophy (SMA), type one. SMA is the number one genetic killer of children under the age of two. Unfortunately, I was diagnosed with the most severe type of this disease and my parents were given a death sentence. Fortunately, for me, my parents did not give up on me and let me live life to the fullest no matter how long I would be here. 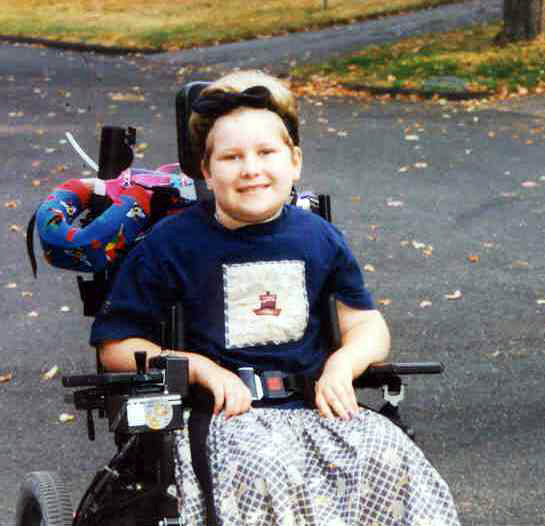 To compound the problem, my sister was born six months after my diagnosis with the same disability, given the same bleak outlook on life. My life has far from typical. When I was three years old, my mother was killed in a car accident. My whole world changed since my mother was my primary caregiver and my best friend. Life was tough as my father had to learn how to care for two disabled children and still earn money to pay for our medical needs. We struggled through different people helping us to survive, but we managed to make it and continued to thrive. 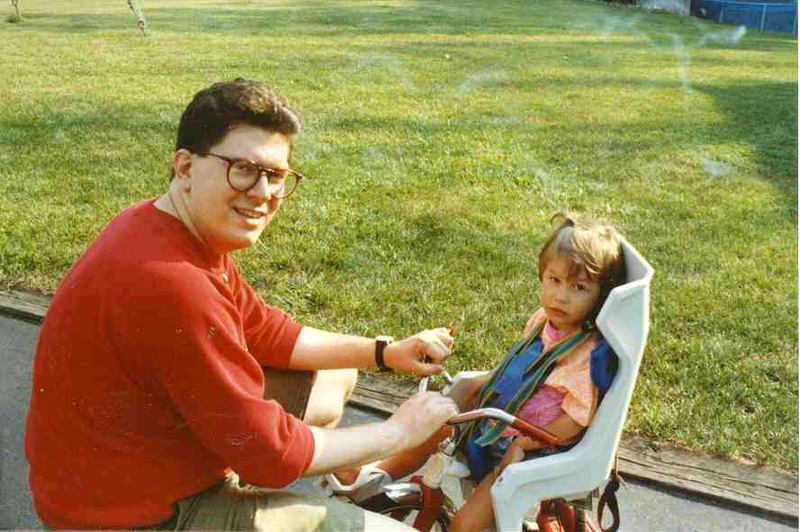 Unfortunately, my sister's life was cut short nine months later. She was only three years old and yet she knew more than most adults. She bravely gave up the fight and joined my mother in heaven. Did I give up after my life was completely altered in less than a year? You tell me. 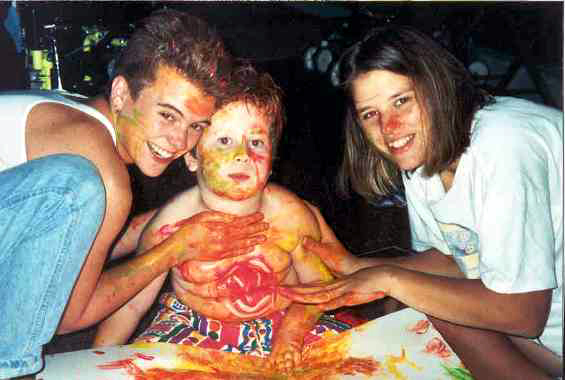 If I gave up, would I be in high school, living out the dreams that my parent planned for me before my diagnosis? Sure, their dreams didn't involve multiple surgeries and hospitalizations or needing to use machines to survive, but everyone's plans change sometime. My parents wanted me to be happy and to go to college and get a good education. That is my goal too but I just have to accomplish it a little differently. So, back to the beginning…why am I called the SMA Queen? Four years ago, I felt guilty for all the gifts I had been given over the years and decided it was time to give back. As an eighth grader, I began sending out handmade cards to about twenty-five kids a month. All of the kids faced medical issues like I do, but all deserved a friendly hello every now and then. The list has grown since then, to over one hundred children with more added every month. As I have continued I felt that cards just weren't enough. 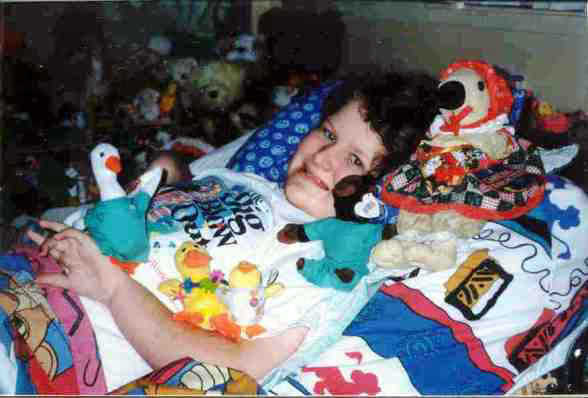 Next added to my list of ever growing things to do, I began giving out beanie babies from my own collection to children with SMA. Did I stop there? No, of course I didn't. Beanie babies just didn't seem like enough either. Last year, I began my own organization, B4SMA. 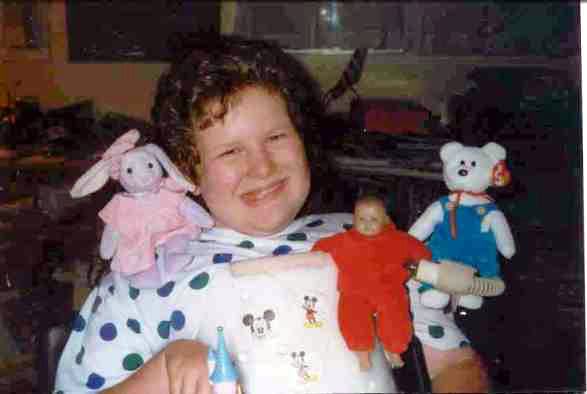 B4SMA, Blankets for SMA kids, is my organization that sends out blankets and stuffed animals to kids who are diagnosed with Spinal Muscular Atrophy. In a little over a year, I have sent out over eighty blankets to different kids in four countries. For now, this has satisfied my need to give back or to pay it forward but I know that there is always more that I can do for others. Because of my giving nature, the families that have received my gifts, have dubbed me "The SMA Queen" since I so much older than their kids. Where ever I travel, I try to personally meet at least one family that I have known through the internet. I never give up on myself or my friends and will always be there for whomever needs me. I am a fighter and possess a strong will to live and to succeed. Where I will go and what I will accomplish next has yet to be seen. I will continue to fight despite my medical challenges and I will follow my dreams. This year I started an organization for newly diagnosed children with SMA, Spinal Muscular Atrophy. I started it in April of 2004. 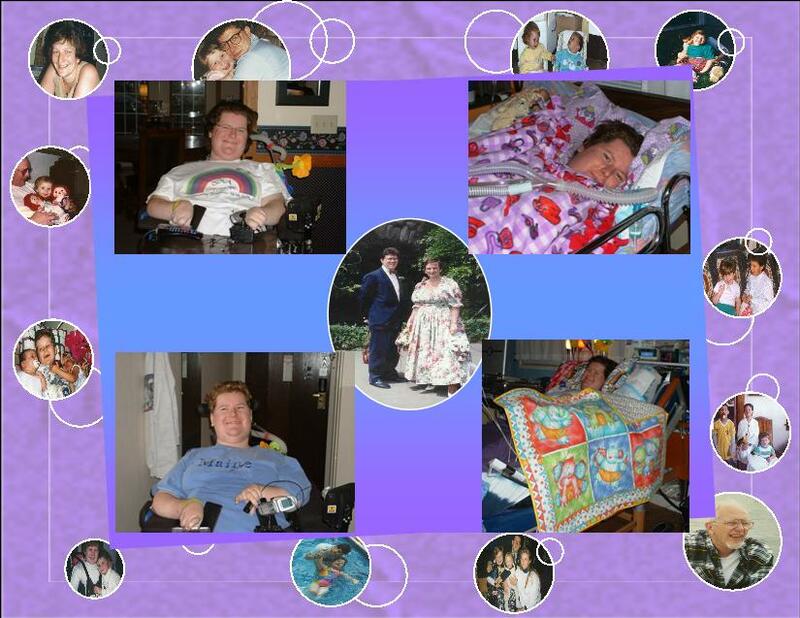 I started my organization because Brenda, my caregiver/nurse, had made me too many quilts. Brenda learned to quilt a few years ago and by April she had made me more quilts than I needed. So that she could continue to enjoy quilting we had decided that we were going to help a friend who had an organization that gave blankets and toys to children with SMA. Brenda told her mom about this organization and her mom decided to help too. When Brenda came home from Easter vacation she had several quilts that she and her mom had made. When we contacted our friend she informed us that she was no longer going to be doing her organization. We were unsure what we were going to do with so many blankets, so I decided that we should start our own organization, B4SMA (Brenda came up with the name). 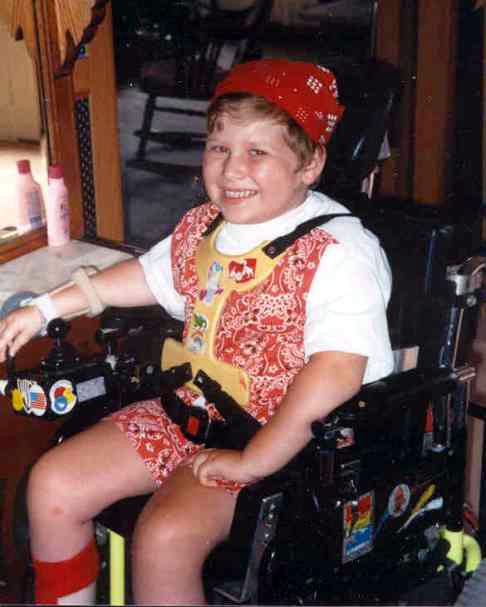 B4SMA stands for Blankets for Spinal Muscular Atrophy kids. 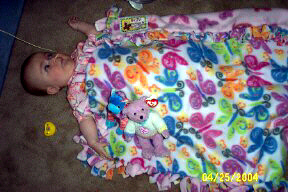 Our first blanket was sent to a little girl in Vermont. Her mom e-mailed us the day they received the blanket, which was a Monday. She also sent us a picture of her daughter with the blanket. When we woke up Tuesday morning there was an e-mail from the little girl's mom saying she had passed away. Her mom, in honor of her daughter, made me a photo album so I can keep all the pictures of the kids that are sent blankets in a safe place. We have now sent out about 440 blankets to kids with SMA in about 17 different countries. With each blanket we send two or three beanie babies. Besides Brenda and I, we now have Brenda's mom, Aunt, and Grandma crocheting, knitting, and quilting blankets for B4SMA. We also have a few others who volunteer. We hope to have more volunteers help us, as B4SMA grows. Once families receive their blanket all we ask of them is that they take a picture of their child with the blanket. I hope one day, when there is a cure for SMA, there will not be a need for anymore kids to receive blankets from us, but until that day I will continue to send blankets. Other than making blankets for my SMA buddies, I also enjoy making cards that I send out monthly. I send to about 100 kids/teens a month. I love hearing how a my little card/note makes a kid smile when they are having a bad day, and that is why I do it! 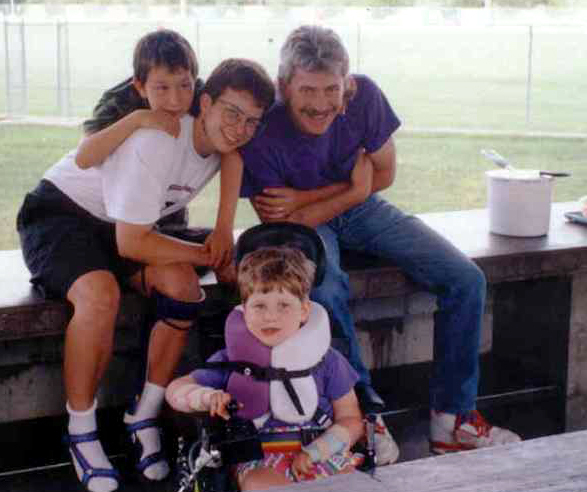 When I was nine months old, my parents found out that I had Spinal Muscular Atrophy. That meant that I would never roll over, crawl, walk, stand, or even sit by myself. It also meant that I would get sick often, choke frequently, and have trouble eating. 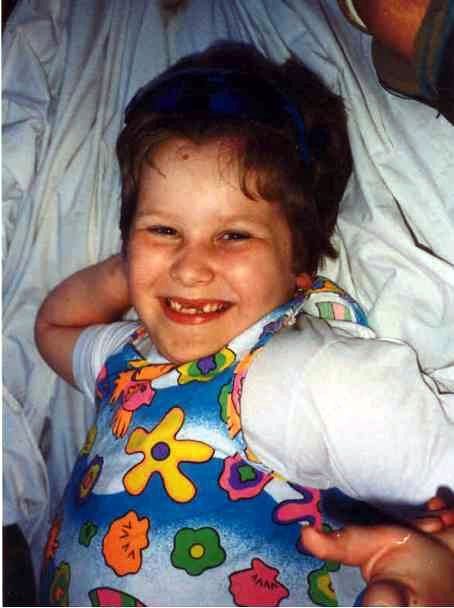 The doctors told my parents to take me home and love me since I would die before I was two. Were they ever wrong! 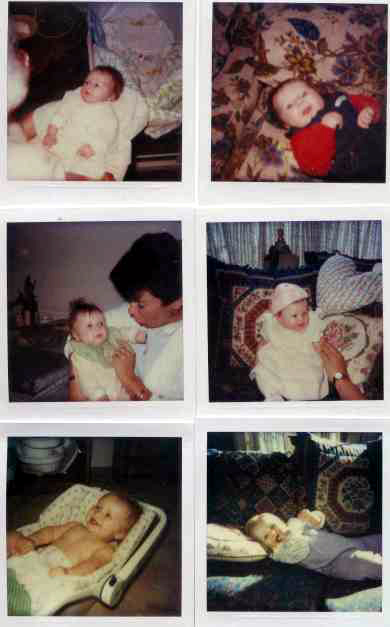 On January 3, 1989, my sister Emma Clare was born. 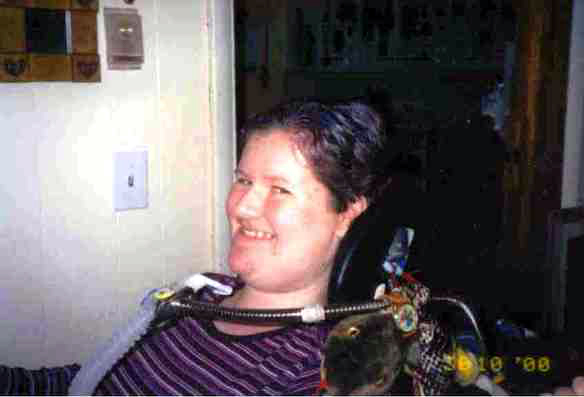 We soon found out that she had Spinal Muscular Atrophy too. Emma and I frequently got sick, but we still attended preschool. When I was three, my mom was killed in a car accident while on a lunch break from work. That was on June 4, 1991. My dad took off work from A & S to take care of us and so did a lot of my aunts and uncles. 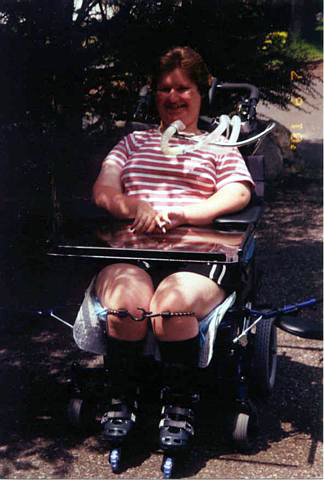 In September of 1991 Brenda came to live with us to take care of Emma and me. That was wonderful. 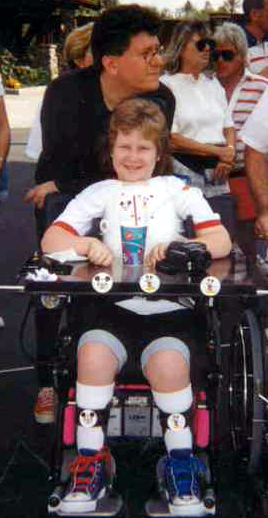 Right before Christmas of that year, I got a big surprise...my first power wheelchair! Finally I was able to go wherever I wanted. Yippee! The sadness in my life didn't end that year, unfortunately. 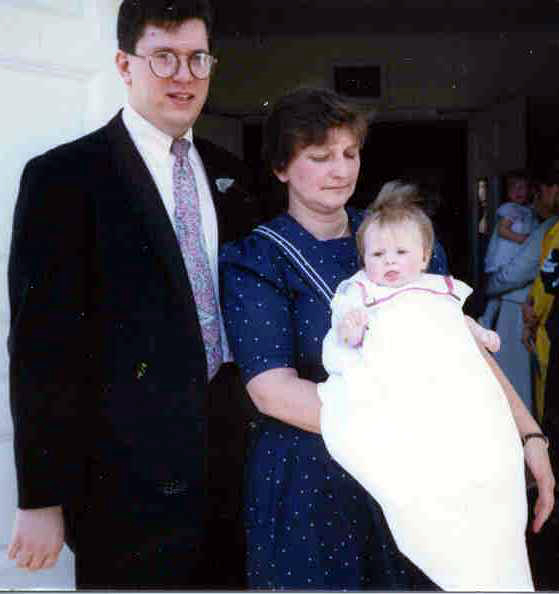 In March 1992, my sister Emma died during a nap. She had a hard time living because she was always in the hospital, and that made her sad. I believe that now she is 'free' to run, play, roll down the steps, and walk. Free like she never was during her life. To help heal the pain of losing half of my family, we started to travel and visit my aunts and uncles. We went to Ohio, Colorado, Wyoming, and Florida in the next nine months. For some odd reason, after Emma's death, I became stronger and healthier for awhile. 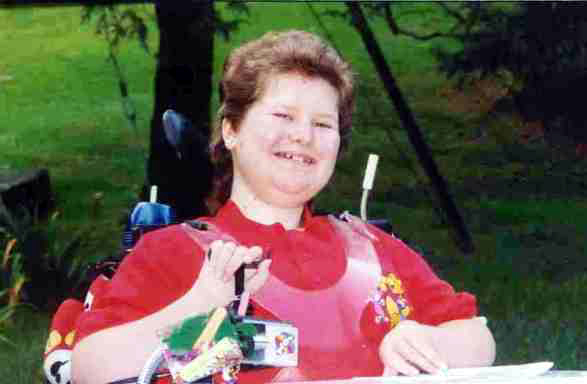 I continued to go to school and take long vacations, even making it to Iowa (Muscular Dystrophy Association Camp) twice. I attended Elementary School for five years. During the second year, my breathing became weaker and I missed a lot of school. In third grade, my doctor wanted to put a hole in my throat to help me breathe...that's called a tracheotomy. 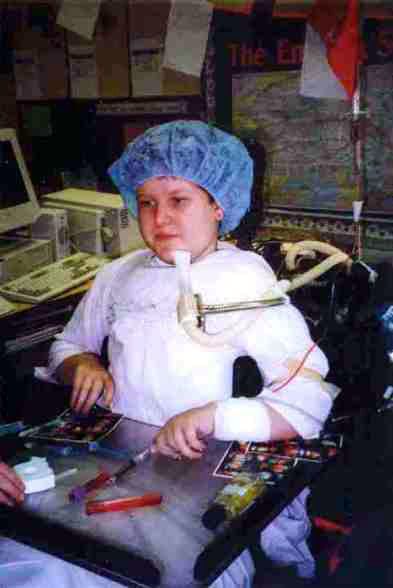 He wanted me to use a special machine to push oxygen in my lungs (a ventilator), too. My father said no and so I didn't. What I did do was miss most of third grade because of pneumonia...it just wouldn't go away. With the help of a new doctor, though, I was healthy and ready to tackle fourth grade. Fourth grade, and this time I missed a lot of school, not from pneumonia, but from having an operation to have my spine fused. The doctors told me that I needed to have the spinal fusion, but they warned us that I might die from the surgery. As you can tell, I didn't. I spent only five days in the hospital after a twelve hour surgery which amazed all my doctors, so much so that one is writing a paper about me. During the surgery, the doctor placed a metal rod that goes from my right hip up my spine to my neck and then back down my spine to my left hip. As a result of the surgery, I grew to my current height of 5' 4". After surgery I lost a lot of muscle strength in my arms from nerve damage and had to learn how to write and feed myself all over again. I also began having more problems with choking and I missed even more school. Despite missing so much school, I managed to graduate, to have a part in our class play, and to sing a solo in "Romeo and Juliet". 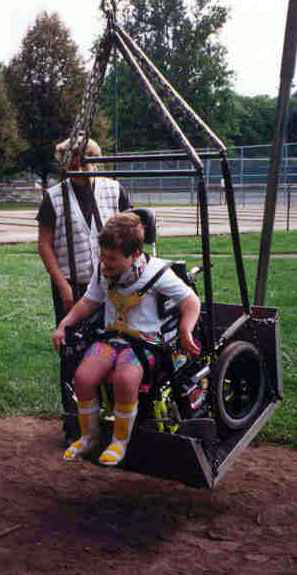 Wheels) for a very long time, a scouting group for boys and girls who use wheelchairs. In middle school, there were many things I like and many things I dislike about it. I'll start with the bad things to get them out of the way. First and foremost is the issue of accessibility. This school, like many others, does not meet federal laws. 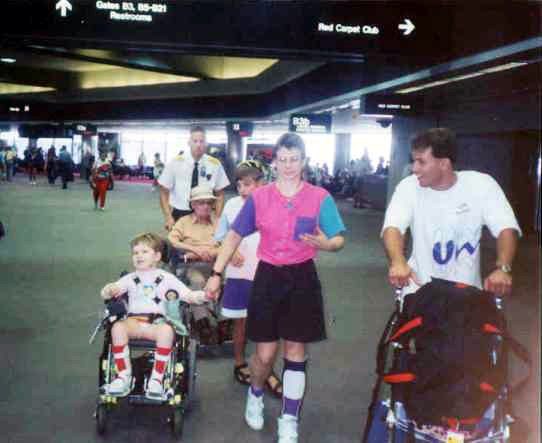 There are no regulation size elevators, accessible bathrooms or drinking fountains; the doors aren't wide enough and they're not automatic; there are no safe parking spots and no handrails on the ramps...and that's just the beginning. These are all things that I would fix if I were in charge. I would also make adults take a disability awareness class, so that they would be more aware of the difficulties faced by people who are disabled. Now, onto the good parts. The teachers were wonderful and were quite aware of my differences and how they do and don't affect my learning. I also had many great friends. I have one especially good friend who I can share secrets with, knowing that she won't tell anyone. I also have other friends that I can hang out and have fun with and not worry about being in a wheelchair. Luckily, I am not teased much. When it does happen, one of the kids from my old school steps in and tells the other kids why I am in a wheelchair. The worst part about being in a wheelchair is not being able to run, jump, or climb like my friends. I really dislike it when people pat my head and won't ask me questions but will ask my father. I also don't like it when I'm out running around and parents tell their children not to stare, but then they stare themselves. I like explaining to little kids why I am in a wheelchair and watching them figure out what it would be like to be in one themselves. One good thing about being disabled is that I don't have to wait in line when I'm at theme parks. And the best thing about being disabled is being able to change people's attitudes about disabilities one at a time. I figure that if I could do that I could make the world more equal for everyone. My 5th grade was a bit rocky to say the least. As I said earlier, accessiblbility was a MAJOR issue. I had go around the building twice daily until I got a serious case (not that every case isn't serious) of pneumonia. The school finally decided to move all my classes to one floor. Other than that, my 5th grade year went remarkably smooth. I enjoyed my teacherers and friends and even made it to a couple of school dances. Hi Everyone MJ here! I received a note from Dr. Bach. I will going to see him on Sunday. Yes, I said Sunday! I'm going to his house! Can you imagine? Me, Margaret Jo Purk, going to Dr. Bach's house. We will be discussing my trach. Finally! I'm a little scared, but I know it is what I need. Well, we went to see Dr. Bach last Sunday...boy was it interesting. Seeing him in a casual setting was different. We went out to dinner with him and his son and also 3 other people. The restaurant was noisy so MJ couldn't hear what anyone else was saying unless we played telephone!! Nothing was decided except that Dr. Bach needs the tests results from the sleep studies they did! MJ was disappointed in that there was no answer yet, but is waiting. We spent 10 days at the lake house. MJ's cousin was there and they had a good time. They spent lots of time sewing for themselves and their dolls. Thursday, I took them to the movies (Rocky and Bullwinkle) with their dolls and they were wearing matching outfits. (When we get the pictures back, I will post them online!) We also got to see fireworks at the beach and MJ's friend came down Saturday to the beach with us. We didn't go to the beach everyday because it was too hard on me to drag MJ's beach chair through the sand, so we hung around the house! We got home today. This week we will get haircuts and take it easy. I think we are going up to Florida, NY to go to the movies with MJ's friend, Liz. Keep signing the guestbook. MJ sure loves to see your messages! 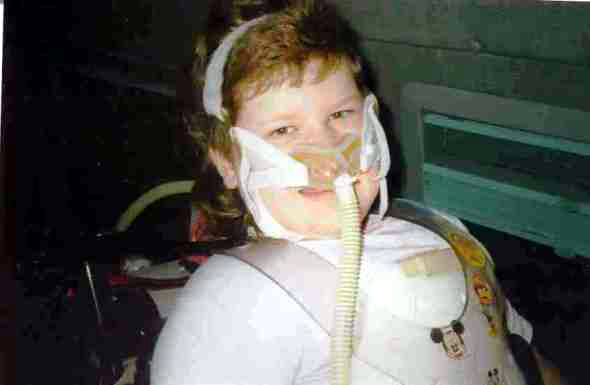 Ultimately, I didn't get a trach but have suffered the consequences of under ventilation. 6th grade was a nightmare for me both physically and emotionally. I was emotionally estranged from both my family and friends. I was ready for that chapter of my life to be over. 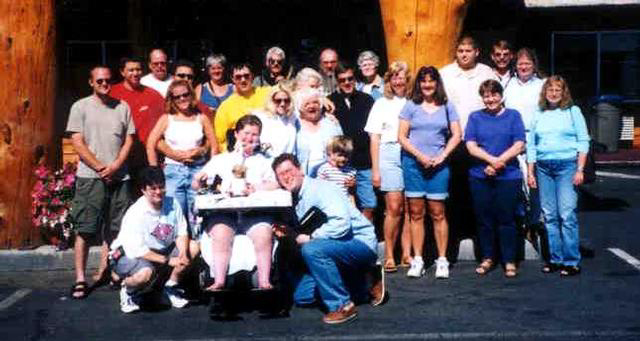 Over the summer of 2000, I drove to Wyoming with my grandma and my caregiver, Brenda. My aunt turned 50 and it had become a tradition for the entire family to travel to the house of the 50 year old. It was a great party!! Well, what a weekend we had!! We had a fun weekend in Vermont. We went to Ben and Jerry's and had a personal tour. MJ says it was like Willy Wonka's factory but Jerry was much nicer than Mr. Wonka!! MJ invited her friend Casey, and his family to join us and the two were the special guests for the day. We got a tour with Jerry (of Ben and Jerry's), got to go onto the floor while making ice cream (which they came in to do just for MJ and Casey), got fresh ice cream right off the line, and got tons of free gifts. Then we went to the Teddy Bear Factory and got a personal tour and MJ and Casey got a free bear of their own choosing. We ate Friday night with Casey's family at a restaurant, Cruisers. Saturday we ate at Aunt Chris's house, but didn't need lunch Saturday cuz of all the ice cream we ate!!! We ate breakfast before leaving Vermont yesterday with everyone again. Casey gave MJ two pumpkins he grew and they are wonderful!! We also stopped at the Yankee Candle Factory in Massachusetts on the way home. What a long weekend but very enjoyable!! 8th grade has been my favorite year for school so far. Despite my swallowing issues, which resulted in the temporary use of an NG tube, I enjoyed my year. I was thrilled to be the only kid my school to get a 100% on the state wide English test. At graduation, I was the only non Spanish speaking student to get a Spanish award. 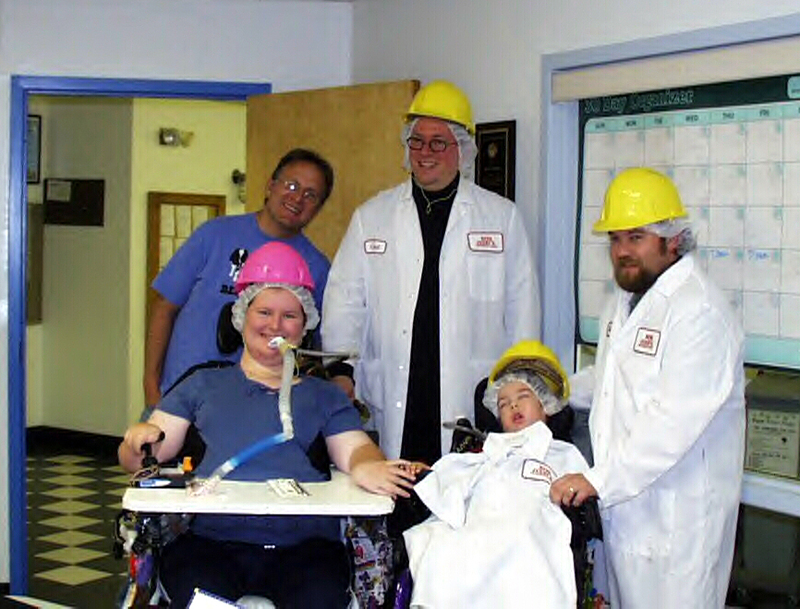 "Margaret won overall at the science fair, so on April 27th, she goes to the tri-county science fair. She did her project on Tolerex, the amino acid formula she drinks. 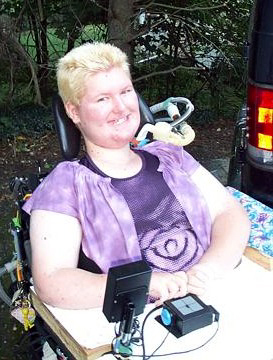 Yesterday was the first day back to school full time, but during 6th period, her manual wheelchair broke. So, we drove over the bridge to get it fixed...luckily, they were able to fix it temporarily until the new part comes in. Margaret is also taking off from school the next three days while her class goes to Washington DC. She is going to stay at home, sleep, play on the computer (she got the new Sims Vacation game) and catch up on homework from being sick! That's all for now. Have a great week." As you can see from my operations updates, 9th grade was extremely eventful. I missed a lot of school due to my surgeries and frequent illnesses. 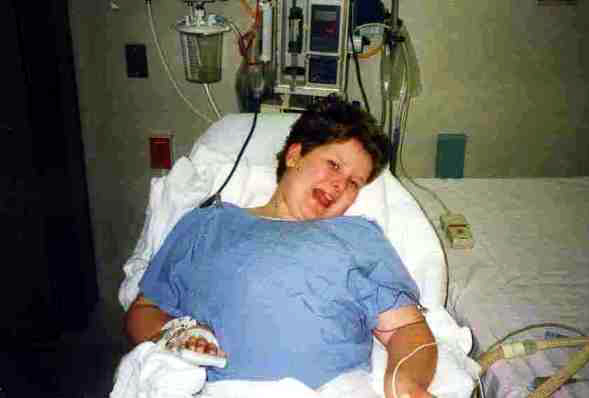 Besides my surgeries, I was hospitalized for a pneumonia. I bet that you want to read more about that, right? You're in luck!! I have that, just click my hospital journey! Read my 9th grade hospital journey here!! Well that is me!!! I'm totally sure that more happened to me than I can remember. I'll leave you with some of my favorite quotes. "Life isn't a destination, it's a journey. Shapes who we are becoming. "Never argue with a stupid person.